A couple of weeks ago, I got an email from someone at Allure inviting me to a very exclusive event for bloggers. For this event, Allure magazine teamed up with Maybelline to share some of Spring 2014's hottest trends and there was no way I was missing out on the action! Which in turn means I'm taking you, my lovely readers, along for the ride! So buckle up 'cause the fun's about to begin! I have to say, I will never grow tired of walking into the beautiful, and oh so intimidating Conde Naste building! Everyone is always dressed to the nines, appropriately so! Upon entering the room where the class was held, I knew I was in for a real treat! To my left stood a few tables with delicious treats along side a bar fully stocked with bubbly and wine! Yes please! 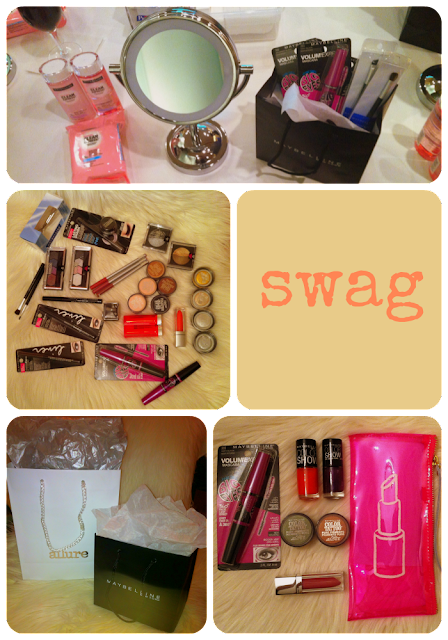 To my right, there were several stations set up for us bloggers to play with an array of Maybelline's finest! 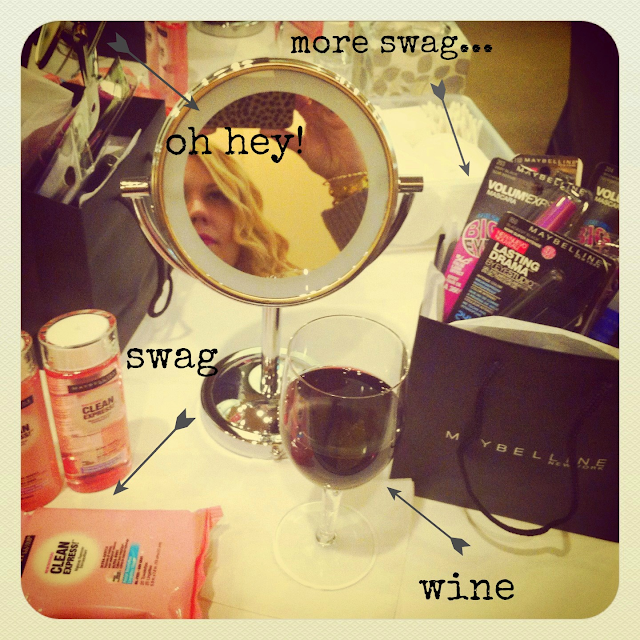 Each table was fully furnished with a mirror, a Maybelline swag bag containing all we'd need to recreate next spring's best looks, makeup removers (three different kinds to be precise), q-tips, sponges etc. Being the makeup loving girl that I am, I did the happy dance twice over with excitement! 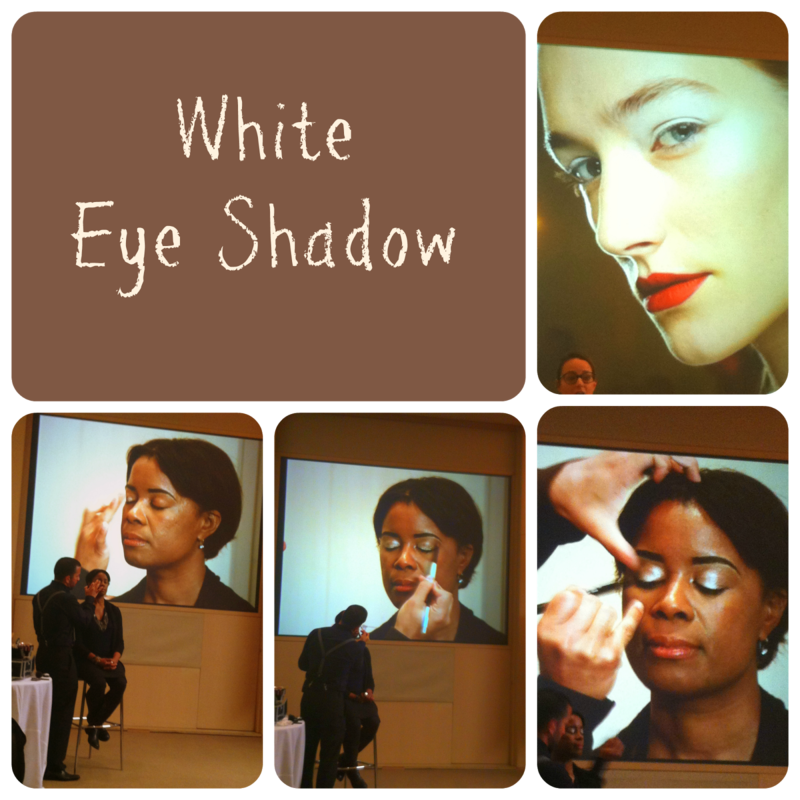 The 'stage area' was set up with a makeup station and tall chairs for the models. There was also a massive screen so that we could all have a closer view of the looks being created. So I picked up a glass of Cabernet, sat down, and began to take notes on my sparkly gold J. Crew notebook because evidently you take way better notes when you do so in a sparkly notebook! You do! Oh, and apparently, said notebook has me totally on trend for next spring... but more on that later! 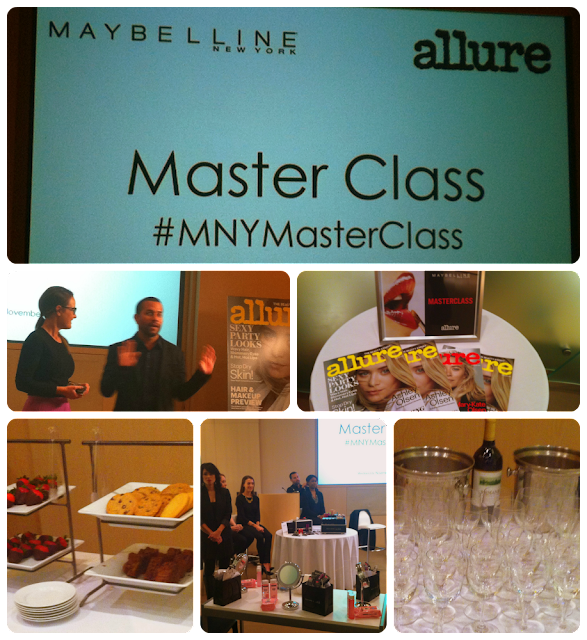 Allure Editor Sophia Panych commenced the class by highlighting some of the hottest trends on the runway for Spring 2014. I must say, for the 10 minutes or so that she spoke, I lived vicariously through her! She shared some of the gorgeous looks spotted on the runways of Paris, Milan and New York. You can sense a real passion in her voice as she delicately exclaimed that gold was a centerpiece in many collections! 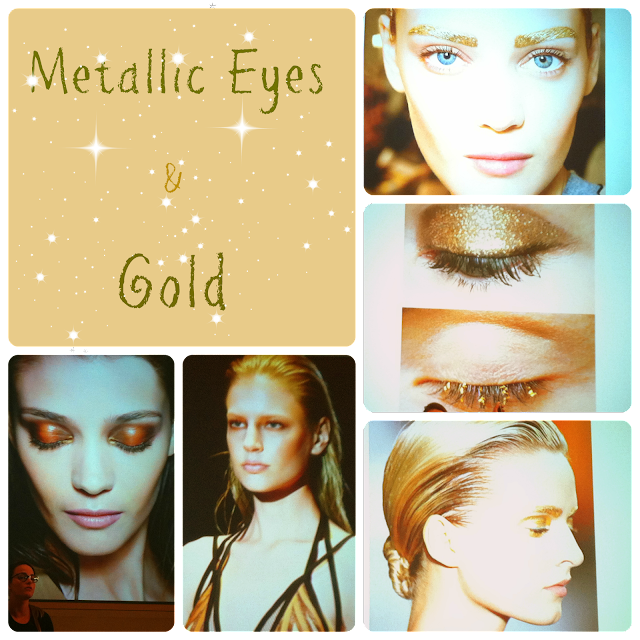 Metallic eyes are a major thing for spring as well as citrus orange lips! This has me so excited because orange is one of my favorite colors and I adore orange lips! I've been rocking this look for quite a while! Who knew... I've been ready for spring 2014 for a couple of years now! Score! Love being ahead of the game! 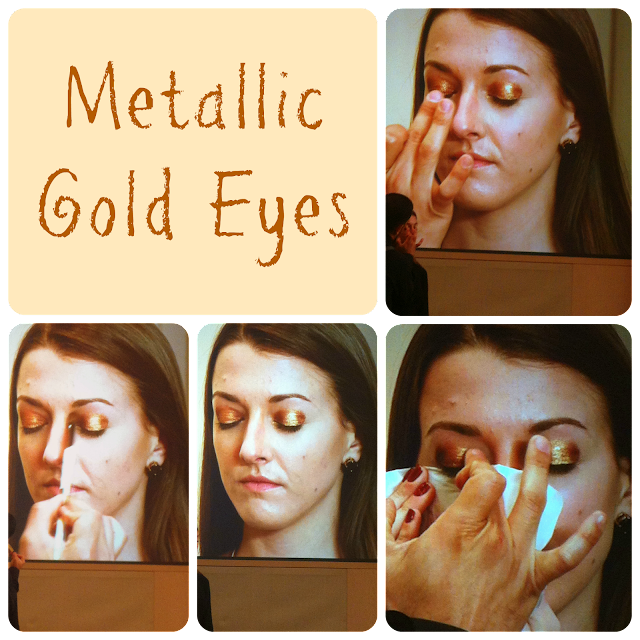 She showed some wearable and some not so wearable looks showcasing 'Artsy Eyes' and metallic gold eyebrows! Can you imagine the amazing job she has? I'd die to go backstage at a show and write about the experience! I was completely inspired by her preview and slightly obsessed with her stunning floor length skirt.... I could never pull it off but she rocked it flawlessly! These looks were essentially fool proof ! My mission in the next couple of weeks, is to create a video tutorial so that I could pass on my new found knowledge to you! If you start practicing now, you'll be totally on trend for spring 2014 in no time! This class was an amazing experience for me! I'm so grateful to Jennifer at Allure for inviting me. I walked away with an abundance of information and better yet, I drew so much inspiration from Gabriel and Sophia! After all, that's what fuels my little blog... a little inspiration and a whole lot of passion! Thank you so much for sharing this experience with me and stay tuned for my video tutorial! What an awesome blogging event! I could definitely benefit from a video tutorial on eye makeup! Wow! It seems really interesting! Wow that's quite an experience Carla....thanks for sharing!!! !